Take a chance—try a new pie this Thanksgiving! Don’t abandon your family favorites; just add one of ours: streusel-topped apple pie, chocolate-pecan pie, pumpkin pie, pecan-banana tart, pear pie or a berry-apple mincemeat pie with a cream cheese crust. 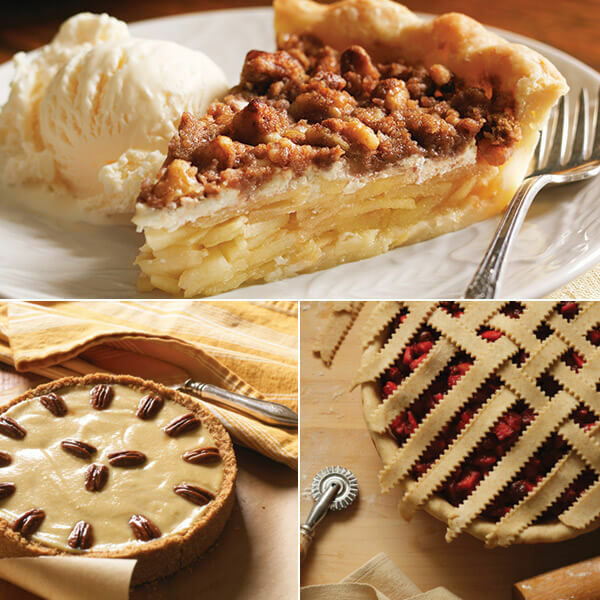 Rich in classic fall flavors, these tasty Thanksgiving pies are sure to delight your guests. The sour cream streusel topping sets this recipe apart from ordinary apple pies. Tip: To get the thinnest, most uniform slices of apple, use a mandolin-style slicer. Have a serious sweet tooth? This is the pie for you. Its blend of chocolaty goodness and nutty pecan flavor is sure to entice you to have just one more bite. This traditional Thanksgiving pumpkin pie recipe features a gingery whipped-cream topping for a tasty twist. The word “mincemeat” has come to mean this type of finely minced, spiced dried-fruit filling, but old-style recipes actually had minced beef and suet, and sometimes lamb! A vanilla wafer crust, banana filling and honey-roasted pecan topping makes this a sweet alternative to traditional pies. This pie is based on the flavors of pears belle Hélène, a French dessert made with poached pears, chocolate sauce and ice cream.